I've spent the last couple of weeks creating a dress for Tessuti's Skylines Dress Competition. I partly wanted to challenge myself but mainly I just wanted to try and win a voucher to this beautiful Australian fabric store! 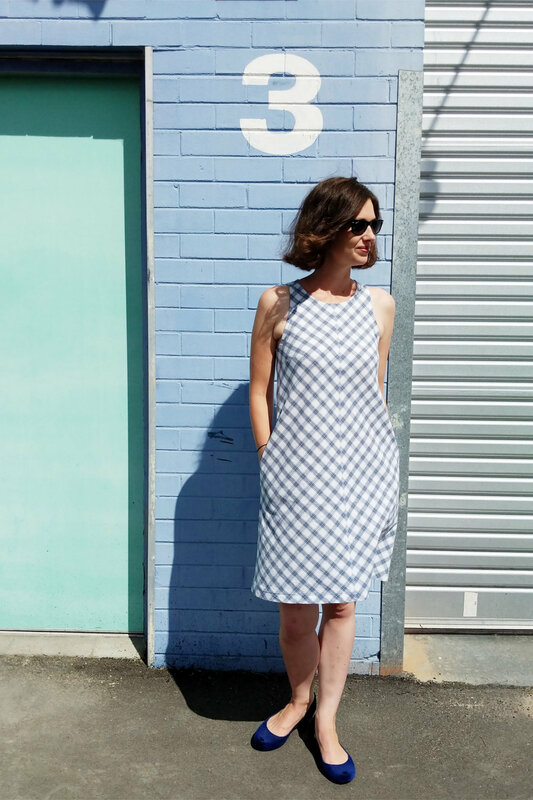 To enter the competition, you had to create a garment using the chosen 'Skylines' fabric - a classic blue and white plaid made from cotton, linen, and viscose. The design brief I set myself was to create something simple and modern with beautiful details. I was particularly inspired by the thoughtful use of gingham and plaid I saw in many vintage images. Adding four back darts to give the back more shape and create an interesting design in the plaid. I originally planned to eliminate the front and back seams as well; however, after playing around with the fabric I realised maintaining the seams would create an interesting pattern down the centre front and back. I decided to make this pattern a feature of my design. I had never done stripe or plaid matching before this project so I was a little nervous... but it was actually great fun and very satisfying. I am proud to say all my seams match - even the back darts and the shoulder seams. I have included a range of photos below of the finished dress showing these details. There were a few moments when I thought this dress would not come together but it did - and I am really pleased with it. I am definitely a stripe/plaid matching convert now! It feels a little like magic when everything comes together and you create an interesting pattern in the fabric using only seams and darts. Thank you very much to Tessuti for creating such a fun competition which inspired me and pushed me to develop my design and sewing skills. There are a lot of fabulous entries you can check out on Instagram using the hashtag #tessutiskylinescomp.